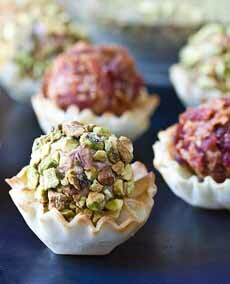  Mini cheese balls in phyllo cups. Here’s the recipe from A Spicy Perspective. Stick a pretzel in it—or a carrot stick. Here’s the recipe from Five Heart Home. Some like it hot. Here’s the recipe from Young Austinian. 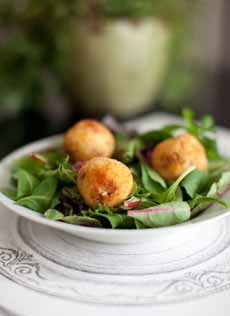 Serve cheese balls with a green salad, combining the cheese course and the salad course. Here, the cheese balls are fried goat cheese. Get the recipe is from Anna Costa Food. The granddaddy of cheese balls is cold pack cheese, which itself was inspired by Scadinavian potkäse. National Cheese Ball Day is April 17th. But if you’re not having a party—home of the cheese ball—you can turn that hefty cheese ball mini cheese balls. As dessert (sweet cheese balls). A few different recipes will enhance the experience. If you don’t have your own favorite recipes, check the recipes in the photo captions. The cheese ball is rooted cold-pack cheese, also known as club cheese or crock cheese, which began as a snack in Wisconsin taverns and supper clubs around the turn of the last century. Cold pack cheese originated in Wisconsin (we’ll get to that in a few paragraphs). 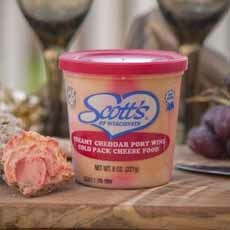 In our youth, a crock of port wine cheddar was considered sophisticated party fare, served with party pumpernickel slices or fancy crackers (in those days, Stoned Wheat Thins and Carr’s Water Biscuits) or (never everyday crackers such as saltines, Ritz crackers, Town House or Uneeda Biscuits). According to the New York Times, the tradition derived from Scandinavia, where cooks would grind odd bits of cheese with seasonings and often a bit of alcohol, and pack the resulting spread into jars or crocks, with a top layer of butter to preserve it. It spread (no pun intended) to Britain, and then turned up in the U.S.
At taverns and private clubs, sharp cheese and cream cheese were blended into a spread that went well with beer and drinks. The crock engendered cheese balls and cheese logs, coated with herbs and/or nuts. Cream cheese is an American invention from 1872 in New York State. It began to get wider distribution in 1880 (history). At Wisconsin taverns in the early 1900s (including Milwaukee’s Pabst Brewery), mixed bits of different cheeses were turned into a snack for customers that became known as pub cheese—a term that still survives, but is know better known in stores as cold pack cheese. The Center for Dairy Research (CDR) at the University of Wisconsin-Madison proposes that cold pack began as a type of dip or spread made from older cheeses that were beginning to dry out. Potkäse, a similar potted cheese recipe from Sweden and Denmark, would have been well-known to the many families of Swedish immigrants in the Midwest. According to the CDR, as reported in Edible Milwaukee, a beer depot operator named Hubert Fassbender began giving homemade cold pack cheese to his best customers in 1933. Customers started asking for the cheese without the beer. Fassbender created the Fassbender’s Kaukauna* Klub brand, making him the first manufacturer of cold pack cheese. The following year, in 1934, Armin Herke formed the Calumet Cheese Company, and used surplus cuts of cheese to produce cold pack. The brand later became known as WisPride and remains popular today (it is now owned by Bel Brands). It was just a jump from cold pack to cheese logs and cheese balls. A classic cheese ball combines shredded sharp cheese like cheddar or blue, blended with cream cheese (sometimes also with butter) for spreadability. Popular seasonings include chile, chives/onion, garlic and herbs. Chopped vegetables can be mixed in. The ball is then rolled in nuts and/or herbs. 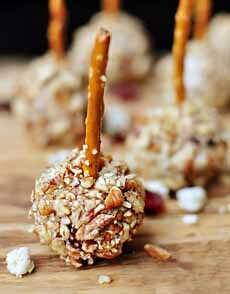 Sweet cheese balls evolved with time: fruit, sugar and cream cheese, cocoa, sugar and cream cheese, etc., mixed with anything from mini chocolate chips to cookie bits, and rolled in Oreo (or other cookie) crumbs, pomegranate arils, toffee bits or other sweet ingredient. 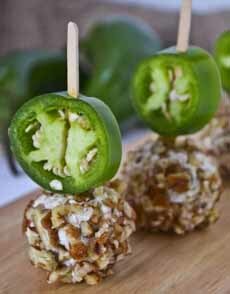 They can be served as snacks or as dessert. From Wisconsin, the mighty cheese ball spread across the nation. Is there a part of the U.S. that doesn’t know about cheese balls? If so, let us know: We’ll clue them in.